Yossi Milo Gallery is pleased to announce an exhibition of color photographs by Loretta Lux. The exhibition will open on Thursday, May 18, and close on Saturday, June 24, with a reception for the artist on Saturday, May 20, from 6:00 to 8:00 pm. This will be Ms. Lux’s second solo exhibition in the United States and will include her work from 2004 to 2006. In her new series, Loretta Lux creates scenarios of isolation and distance that occur in an ambiguous time and space, with a focus on the interaction between characters and the suggestion of narrative. 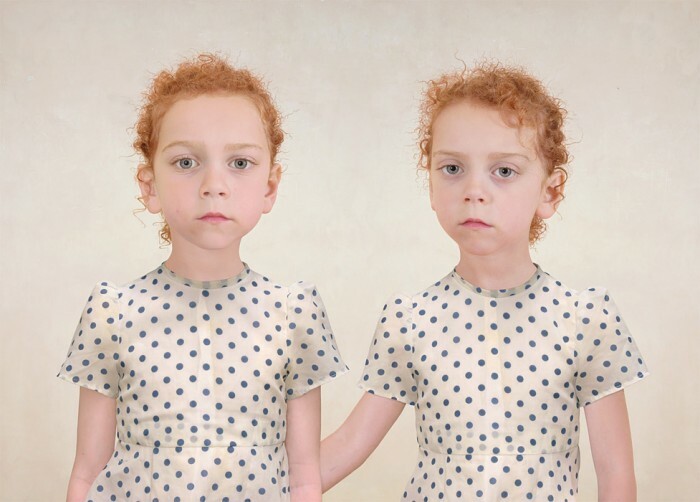 For example, in images such as The Walk (2004) and Sasha and Ruby (2005), the artist explores the double portrait, in which the relationship between two self-aware children is characterized by detachment and alienation. The artist executes her compositions using a combination of photography, painting and digital manipulation, favoring simple backgrounds over the more elaborate backdrops that characterized her earlier work. Trained as a painter at the Munich Academy and influenced by Old Masters such as Goya, Bronzino, Runge, and Velasquez, Ms. Lux works the entire surface of the photographic image in the computer over the course of many weeks. Props and vintage costumes are carefully selected, as are her subjects. In 2005, Ms. Lux received the Infinity Award for Art from the International Center of Photography. Her work has been exhibited extensively abroad, including solo exhibitions in 2006 at the Fotomuseum den Haag, The Netherlands, and the Sixth Moscow Photobiennale. Her work is included in numerous collections in Europe and the United States, including the Solomon R. Guggenheim Museum; San Francisco Museum of Modern Art; Museum of Contemporary Art, Los Angeles; Los Angeles County Museum of Art; Art Institute of Chicago, Israel Museum, Jerusalem; Photo Museum Munich; and Musée de l’Elysée, Lausanne, Switzerland. Loretta Lux was born in Dresden, Germany in 1969 and currently lives and works in Monaco.